So far, the Sinclairs standout as one of my favorite "lines". Many have died in battle, and Henry I roamed much of the North American coast a 100 years prior to Columbus. The name Sinclair is of Norman (Norsemen) origin from "Saint-Clair-sur-Elle" and was established in Scotland in 1162 when Henry de St Clair of Roslin was granted lands in Lothian. His descendant Sir William became guardian to the heir of Alexander III and gained the Barony of Rosslyn in 1280. His son, Sir Henry fought with Bruce at Bannockburn (as a Templar Knight) and was one of the Scottish barons who signed the letter to the Pope asserting Scottish independence (after the Pope excommunicated the entire country). His son, Henry married Isobel, co-heiress of the Earldom of Orkney and Caithness and thus transported the Sinclairs to the far north of Scotland. Their son, Henry Sinclair of Roslin became Earl of Orkney in 1379, obtained from King Haco VI of Norway. In 1455 William, 3rd Sinclair Earl of Orkney was granted the Earldom of Caithness. He also founded the celebrated Rosslyn Chapel in 1446, where people have been looking for the Templar treasure ever since. In 1470 the Earl of Orkney and Caithness was compelled to resign Orkney to James III in exchange for the Castle of Ravenscraig in Fife. The King was jealous of the semi-royal chief of the Earldom of Orkney which had been inherited by the Sinclairs from the Norse Sea-Kings. The Earls of Caithness were engaged in a long succession of feuds with the Sutherlands, the Gunns and the Murrays, often giving rise to violent deaths. The 2nd Earl, William died at Flodden and the 3rd Earl in a Sinclair Civil War in the Orkneys. The direct line came to an end with George, 6th Earl who through debt granted the title and estates to Sir John Campbell of Glenorchy. In 1676, after Sir John assumed the title, George Sinclair of Keiss disputed the claim and seized the Caithness estates, only to be defeated in 1680 by the Campbells near Wick. Although the claim was lost by the sword, the Privy Council rendered his claim in 1681 and he became the 7th Earl of Caithness. At the time of the '45 the northern Sinclairs were ready to join Prince Charles Edward however after Culloden they disbanded quietly. The Earldom has since passed through many Sinclair families and up until 1986 a Sinclair Earl of Caithness owned the long-ruined stronghold, Castle Girnigo, and the Sinclairs of Ulbster still hold vast estates in Caithness. Septs and dependants of the Sinclairs include Caird, Clouston, Clyne, Linklater and Mason. PIBROCH: Spaidsearachd Mhic nan Ceàrda. Every Scottish schoolboy is familiar with the story of the heroic fight with the Moors on a field of Spain in which the Good Lord James of Douglas met his death. In that fight, it will be remembered, Douglas noted that a Scottish knight, Sir William St. Clair, had charged too far, and had been surrounded, by the enemy. "Yonder worthy knight will be slain," he exclaimed, "unless he have instant help," and he galloped to the rescue. Then, himself surrounded by the enemy, and seeing no hope for escape, he took from his neck the casket containing Robert the Bruce’s heart, and threw it forward among the enemy. Pass first in fight," he cried, "as thou were wont to do; Douglas will follow thee or die! " and pressing forward to the place where it had fallen, was himself slain. The William St. Clair who thus comes into historical note, and who, with his brother John, was slain on that Andalusian battlefield, was the ancestor in direct male line of the Sinclairs, Earls of Caithness, of the present day. Like so many of the great Highland families, the St. Clairs were not originally of Celtic stock. Their progenitor is said to have been William, son of the Comte de St. Clair, a relative of William the Conqueror, who "came over" with that personage in 1066. He or a descendant seems to have been one of the Norman knights brought into Scotland to support the new dynasty and feudal system of Malcolm Canmore and his sons. In the twelfth century there were two families of the name, the St. Clairs of Roslyn and the St. Clairs of Herdmonstoun respectively, though no relationship was traced between them. Sir William de St. Clair of Roslyn, who flourished in the latter half of the thirteenth century, was a guardian of the young Scottish king, Alexander III., and one of the envoys sent to negotiate the French marriage for that prince. He was sheriff of Dumfries and justiciar of Galloway, and, as a partizan of Baliol, was captured by the English at Dunbar in 1294, escaping from Gloucester Castle nine years later. His son, Sir Henry, was also captured at Dunbar, but exchanged in 1299. He was sheriff of Lanark in 1305, fought for Bruce at Bannockburn, and received a pension in 1328. It was his brother William, Bishop of Dunkeld, who repulsed the English at Donibristle in 1317 and crowned Edward Baliol in 1332. Sir William St. Clair who fell in Spain in 1329 was the elder son of Sir Henry St. Clair of Roslyn. His son, another Sir William, who succeeded to the Roslyn heritage, added immensely to the fortunes of his family by marrying Isabella, daughter and co-heir of Malise, Earl of Strathearn, Caithness, and Orkney. In consequence his son Henry became Earl or Prince of Orkney at the hand of Hakon VI. in 1379. He conquered the Faroe Islands in 1391, wrested Shetland from Malise Sperra, and with Antonio Zeno, crossed the Atlantic, and explored Greenland. His son, another Henry Sinclair, second Earl of Orkney, was twice captured by the English, at Homildon Hill in 1402 and with the young James I. on his voyage to France in 1406. He married Isabella, daughter and heiress of Sir William Douglas of Nithsdale, and the Princess Egidia, daughter of Robert II. ; and his son, William, third Earl of Orkney, was one of the most powerful nobles in the country in the time of James II. The Earl was one of the hostages for the ransom of James I. in 1421, and in 1436, as High Admiral of Scotland, conveyed James’s daughter to her marriage with the Dauphin, afterwards Louis XI. of France. At his investiture with the earldom of Orkney in 1434 he acknowledged the Norwegian jurisdiction over the islands, and in 1446 he was summoned to Norway as a vassal. 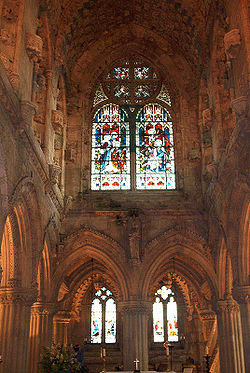 In this same year he began the foundation of the famous Collegiate Church, now known as Roslyn Chapel, on the Esk near Edinburgh, which is perhaps at the present hour the richest fragment of architecture in Scotland, and in the vaults of which lie in their leaden coffins so many generations of "the lordly line of high St. Clair." Sir Walter Scott has recorded in a well-known poem the tradition that on the death of the chief of that great race Roslyn Chapel is seen as if it were flaming to heaven. At his great stronghold of Roslyn Castle at hand the Earl of Orkney lived in almost regal splendour. In 1448, when the English, instigated by Richard, Duke of York, broke across the Borders and burned Dumfries and Dunbar, the Earl assisted in their repulse and overthrow. In the following year he was summoned to Parliament as Lord Sinclair. From 1454 to 1456 he was Chancellor of Scotland under James V., whose side he took actively against the Earl of Douglas, though Douglas’s mother, Lady Beatrice Sinclair, was his own aunt, and who, in 1455, on his relinquishing his claim to Nithsdale, made him Earl of Caithness. This honour was no doubt partly due to the fact that, through his great-grandmother, the wife of Malise of Strathearn, he inherited the blood of the more ancient Earls of Caithness, the first recorded of whom is said to be a certain Dungald who flourished in 875. A few years later certain actions of Earl William and his son may be said to have brought about the marriage of James III. and the transference of Orkney and Shetland to the Scottish crown. During some disagreement with Tulloch, Bishop of Orkney, St. Clair’s son seized and imprisoned that prelate. Forthwith Christiern, King of Denmark, to whom Orkney then belonged, wrote to the young Scottish king demanding not only the liberation of his bishop, but also the arrears of the old "Annual of Norway" which Alexander III. of Scotland had agreed to pay for possession of the Hebrides. The matter was settled by the marriage of James III. to Christiern’s daughter, Margaret, the annual of Norway being forgiven as part of the princess’s dowry, and the Orkney and Shetland islands pledged to James for payment of the rest. St. Clair was then, in 1471, induced to relinquish to the king his Norwegian earldom of Orkney, receiving as compensation the rich lands of Dysart, with the stronghold of Ravenscraig, which James II. had built for his queen on the coast of Fife. The earl was twice married. By his first wife, Elizabeth, daughter of the fourth Earl of Douglas, he had a son and daughter. Katherine, the daughter, married Alexander, Duke of Albany, son of James II., and was divorced, while William the son was left by his father only the estate of Newburgh in Aberdeenshire and the title of Lord Sinclair, by which title the earl had been called to Parliament in 1449. In 1676 this title of Baron St. Clair passed through a female heir, Katherine, Mistress of Sinclair, to her son Henry St. Clair, representative of the family of Sinclair of Herdmonstoun. Through his daughter Grisel and two successive female heirs the estates passed to the family of Anstruther Thomson of Charleton, while the title of Lord Sinclair was inherited by the descendants of his uncle Matthew. The present Lords Sinclair are therefore of the family of Herdmonstoun, and are not descended from the original holder of the title, the great William, Earl of Orkney and Caithness and Chancellor of Scotland, of the days of James II. and III. Earl William’s second wife was a daughter of Alexander Sutherland of Dunbeath, and by her, besides other children, he had two sons. To one of these, William, he left the earldom of Caithness, and to the other, Sir Oliver, he left Roslyn and the Fife estates. It is from the former that the Earls of Caithness of the present day are directly descended. William, the second Earl, was one of the twelve great nobles of that rank who fell with James IV. on Flodden field. So many of the Caithness men were killed on that occasion that since then the Sinclairs have had the strongest aversion to clothe themselves in green or to cross the Ord Hill on a Monday; for it was in green and on a Monday that they marched over the Ord Hill to that disastrous battle. So great was the disaster to the north that scarcely a family of note in the Sinclair country but lost the representative of its name. John, the third Earl, was not less unfortunate. In 1529, ambitious of recovering for himself his grandfather’s earldom of Orkney, and of establishing himself there as an independent prince, he raised a formidable force and set sail to possess himself of the island. The enterprise was short-lived, most of the natives of the islands remained loyal to James V., and, led by James Sinclair, the governor, they put to sea, and in a naval battle defeated and slew the Earl with 500 of his followers, making prisoners of the rest. George, the fourth Earl, has a place in history chiefly by reason of the sorrows and indignities he had to suffer at the hands of his eldest son. That eldest son, John, Lord Berriedale, Master of Caithness, induced his father in 1543 to resign the earldom to him. He married Jean, daughter of Patrick, third Earl of Bothwell, and widow of John Stewart, prior of Coldingham, a natural son of James V., and he set out to aggrandise himself by most unnatural means. Among other exploits he imprisoned his father, and in 1573 strangled his younger brother, William Sinclair of Mey. Earl George himself was mixed up in the history of his time in a somewhat questionable way. In 1555 he was imprisoned and fined for neglecting to attend the courts of the Regent. As a Lord of Parliament in 1560 he opposed the ratification of the Confession of Faith, when that document was abruptly placed upon the statute book. He was made hereditary justiciar in Caithness in 1566, but that did not prevent him taking part in the plot for the murder of Darnley in the following year, nor again did this prevent him from presiding at the trial of the chief conspirator, the Earl of Bothwell. Among his other actions he signed the letter of the rebel lords to Queen Elizabeth in 1570, and was accused of being an instigator of crimes in the north. His son, the Master of Caithness, being dead five years before him, in 1577, he was succeeded by the Master’s eldest son, George, as fifth Earl. This personage, in the days of James VI. and Charles I., engaged in feuds, raids, and other similar enterprises which seemed almost out of date at that late period. It was he who in 1616 instigated John Gunn, chief of that clan, to burn the corn-stacks of some of his enemies, an exploit which secured Gunn a rigorous prosecution and imprisonment in Edinburgh; and it was he who in 1585 joined the Earl of Sutherland in making war upon the Gunns, in the course of which undertaking, at the battle of Bengrian, the Sinclairs, rushing prematurely to the attack, were overwhelmed by the arrow-flight and charge of the Gunns, and lost their commander with 120 of his men. The Earl’s great feud, however, was that against the Earl of Sutherland himself. The feud began with the slaughter of George Gordon of Marle by some of the Caithness men in 1588. By way of retaliation the Earl of Sutherland sent into Caithness 200 men who ravaged the parishes of Latherone and Dunbeath; then, following them up, he himself overran the Sinclair country, and besieged the Earl of Caithness in Castle Sinclair. The stronghold proved impregnable, and when Sutherland retired after a long and unsuccessful siege, Caithness assembled his whole clan, marched into Sutherlandshire with fire and sword, defeated his enemies in a pitched battle, and carried off much spoil. Sutherland retaliated in turn, 300 of his men spoiling and wasting Caithness, killing over thirty of thejr enemies, and bringing back a great booty. The Sinclairs again made reprisals with their whole force. As they returned with their plunder they were attacked at Clyne by the Sutherland men to the number of about 500, but maintained a desperate fight till nightfall, and then managed to make off. On reaching home, however, they found that the Mackays had raided their country from the other side, and, after spreading desolation and gathering spoil, had retired as suddenly as they had come. When these raids and counter-raids with the men of Sutherland were over, the Earl of Caithness found other openings for his turbulent enterprist. After committing an outrage on the servants of the Earl of Orkney, he earned credit to himself by putting down the rebellion of Orkney’s son, and for this in 1615 received a pension. Having, however, committed certain outrages on Lord Forbes, he was obliged to resign his pension and the sheriffdom of Caithness in order to obtain pardon. For his various acts a commission of fire and sword was issued against him, and he was driven to seek refuge in Shetland. It was not long before he was allowed to return, but he did so only to meet his creditors, and at his death twenty years later he left his affairs still in a state of embarrassment. Vagabond, traveler, revolutionary, infidel, rambler, drifter, scallywag and genealogist.